The site is located on a tributary to Paradise Creek. The channel had been straightened to allow for cultivation to the stream’s edge. Reed canarygrass was the dominant streambank plant species and woody riparian vegetation was largely absent. There was no filter for agricultural runoff laden with sediments, nutrients and pesticides. The stream channel was extremely simplified, with no pools or shading to moderate stream temperatures. Eroding streambanks were evident. 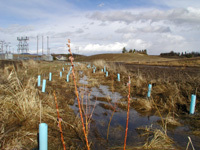 A riparian buffer was planted along 860 feet of the Paradise Creek tributary. The buffer included 563 native trees and shrubs. Plastic plant protectors were installed on the plants. Weeding, watering and other maintenance activities occurred following planting.The Harden family collaborated with PCEI to design, implement, and perform maintenance on the restoration project. AmeriCorps*NCCC members, Washington State University students of Environmental Science, and community volunteers participated in restoration plantings, watering and weed control on the site. These stream segments was typified by a straight ditch like stream. Few trees or woody vegetation grow along this segment of a tributary to Paradise Creek had no vegetation, causing the water to heat up during low flow periods of the year. Reed canary grass was the dominant vegetation along this stream segment. This reach was impacted by open farm fields and an unestablished tree farm. Before Work Began: No vegetation along the stream and lack of streambank stability characterized this stream reach before our work began.